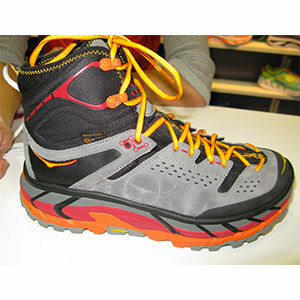 Hoka, known for its super cushioned running shoes and Meta-Rocker extends into hiking boots with the Tor Ultra Hi WP. 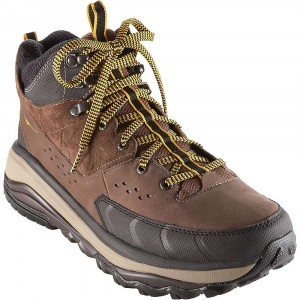 The hiking and backpacking crossover boot keeps Hoka’s running shoe form and adds on a leather and nylon mesh upper for hiking support. For traction and performance on the trail, the Tor Ultra Hi WP features a Vibram MegaGrip sole with five millimeter lugs and a waterproof-breathable eVent membrane to keep feet dry all day. 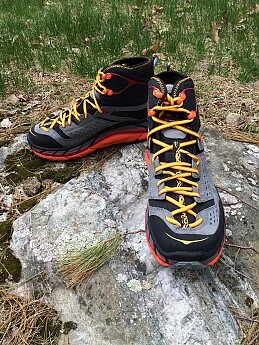 The Tor Ultra Hi WP weighs slightly more than a pound per shoe and is part of Hoka’s MTN Trek line. Maria Hidalgo showed us the Tor Ultra High WP at Outdoor Retailer. Hoka has taken a major step in the right direction with this new offering. The Hoka One One Tor Ultra Hi WP boot is a combination of the best technology on the market, premium design, and construction. Hoka took these three things, and developed a revolutionary one of a kind hybrid between their running shoes and a backpacking boot. I had never heard of, yet alone tried on a pair of Hoka One One footwear before this. As soon as my feet were securely strapped into these new boots I began to fall in love. 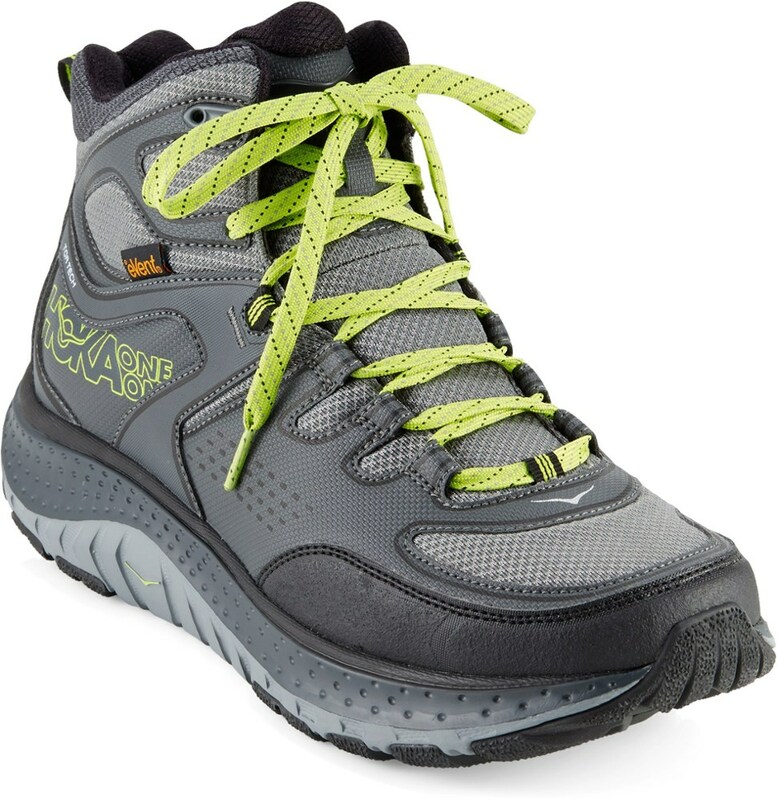 Extreme comfort, breathability, light weight, excellent traction, and *waterproof (see review). Strap this new pair of boots on your feet and get on the trail, you will not be disappointed! I had the opportunity to put this new offering from Hoka One One to the test for about three months, and I assure you that I really put them through the ringer. Over the course of three months they saw about 400 miles of use, over various types of terrain, in a variety of conditions. 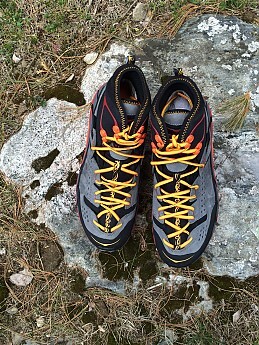 From day one I was impressed with the Tor Ultra Hi WP boots. I want to start this off by saying that footwear is a very personal choice for people, and I am no exception. 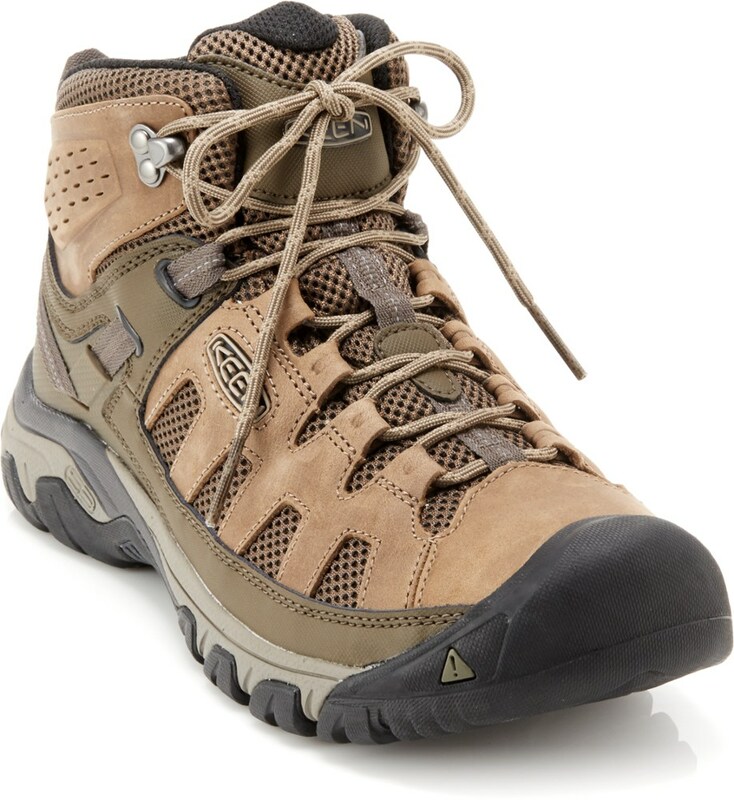 I routinely buy my footwear with a few key factors in mind; breathability, comfort while carrying a load(backpacking), and traction. You will note that I didn’t list waterproof. In my early days of backpacking I was always looking for waterproof boots, but over time I have veered away from that because of the lack of the majority of boots to breathe adequately to promote a dry, comfortable, blister free environment for my feet. I had settled into using full grain leather boots, with no waterproof membrane. Enter the Hoka One One Tor Ultra Hi WP boots. At first look out of the box I was literally shocked at what I saw. WOW, these boots are bright! It really was a shock to my system at first, as I literally do not wear anything remotely approaching the brightly colored nature of these boots. Everything is bright except for the main body, the midsole, outsole, laces, and trim are all BRIGHT! But, as the miles added up, along with the dirt and grit, they started to grow on me and became less appalling to my eyes. Though, I will be the first to admit that I would love to see these offered in a more earthy tone. You can certainly tell that the manufacturing and QA process for this footwear is top notch. Everything from the way the stitching is laid out, to the choice of materials really has that touch of high end quality to it. I could tell before I ever even put them on that these were going to me amazing. One of the things that struck me immediately (other than the color) was how light they were. I also noticed that the midsole was remarkably thicker than any other footwear I own. The uppers are a combination of full grain leather and textile material. Now let’s stop right there for a moment. They say “full grain leather”, but in my opinion they are far from typical full grain leather. I own a lot of leather boots, gloves etc, and while these may be leather; they are not nearly as robust as your traditional full grain leather items. Now that being said, I am far from a leather expert, so take that for what you will. I am in no way saying that the uppers of these boots is fragile, or poor quality, or anything of the sort. I am just trying to drive home the point that if you’re expecting that traditional thick, rugged, tough leather, that’s not what you’re getting. This is softer, more subtle leather. There is also some kind of a plastic material in the mid portion of the boot in the heel area, the manufacturer makes no mention of what this is, so I will leave it at “plasticky”. This small “plastic” area seems to provide a little more rigid structure to the heel portion of the boot as a whole. The interior of the boot is covered in eVent fabric, to provide a waterproof and breathable barrier. This eVent fabric is installed in a bootie style to minimize seams. Now let’s get to the midsoles. They are thick, approximately 1 to 1.5 inches depending where you measure it, and constructed of a combination of EVA and RMAT. “RMAT is an injection molded midsole foam that provides a state of the art weight-to-resilience ratio and excellent energy return while still offering Hoka’s signature performance and cushioning.”-Hoka One One. You can really feel the effect of this thick midsole material when you’re wearing the boots. It truly is unique, and amazingly comfortable. You can feel it give and expand with every step, it was very noticeable to me at first but as time went on I got more accustomed to it. No other footwear I have has this kind of cushioning, and I mean not even close. Transitioning from the midsole we get into the Vibram MegaGrip outsole. This is a high traction rubber outsole with 5mm lugs. The rubber material is very pliable and “sticky”. Then you also have the protective toe cap which comes about ¾ of the way up the toe of the boot. The sole and midsole are actually part of the toe cap as they make a thinner transition up the front of the boot. The toe cap is completed with the addition of some protective material(rubber?) at the top of the toe area. I really like the MegaGrip outsole in general. It does have some cons, but overall I think it is an excellent outsole. Let’s start with the cons. Durability; I do not think that these soles will last a very long period of time, especially if these boots see heavy use. Since they are softer in nature, they begin to suffer wear and tear almost immediately. They have held up adequately thus far, but I am almost certain I would not be able to get any more than 2 or 3 years use out of them before needing to resole them. I typically get 6-8 years out of most of my other Vibram soles. The outsoles have noticeable wear after 3 months of use. Now, that being said, these soles provide way more traction than any other Vibram sole I have used. In fact my main complaint with most vibram soles is they are so hard and tough that they can be very slippery when on wet rock etc. I honestly felt like Spiderman while wearing these with amazing traction, especially on wet slick surfaces. So if I have to suffer a little durability to shoot web out of my wrists and deftly maneuver around the mountains like a superhero, then so be it. I found that these boots fit true to size. I typically wear a size 10.5, but routinely order a size 11 for backpacking footwear to account for foot swelling while hiking. I have the size 11, and they fit as expected. The fit in general is fairly snug, it feels like the inside of the boot is making positive contact with all of the foot. There are no noticeable gaps or space inside. The boot in general hugs and conforms well to the shape of my foot. Arch support is excellent. The semi rigidity of the plastic around the heel cup provides ample ankle support. The interior shape, combined with being neatly trimmed and sewn help prevent unnecessary points of contact to minimize friction that would cause chaffing and blisters. The snug fit did a good job of keeping the top of the boot sealed, and I had no issues with debris entering the boot while hiking. As previously mentioned, these boots are very comfortable. By far the most comfortable boots I have ever used. They required no break-in period for me, and were just as comfortable on day one as they were after three months of hard use. 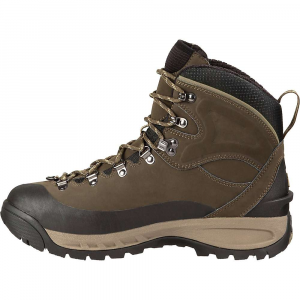 The fit and comfort of these boots to me was certainly near perfect, not once did I encounter any pressure points, hot spots, blisters, or other discomfort related to poor fit. This even held true when wearing the boots while completely soaked and wetted through. Over three months I put in about 400 trail miles, and who knows how many miles in daily wear around town and working around the house. I didn’t wear them to work everyday (safety requirement), but I wore them every chance I got otherwise. I try to give every item I test a good amount of use, but with these boots I honestly found myself reaching for them quite often; leaving everything other than my work boots gathering dust in the closet. The majority of use was in the Northeast, more specifically in Connecticut; though they did see a week of use in the lowlands of Mississippi. Oh yes, I suffered ridicule from my wife, family members, and friends. Why? Because before they were subdued with a bit of dirt and grime, they shined like a bright beacon in the night sky, which is a bit out of character from my typical color choices. But as I mentioned previously, they did grow on me as the days passed, and the ridicule and teasing slowly subsided. I suffer from plantar fasciitis. It is far from a severe case, but it is very uncomfortable and sometimes downright painful at times. I had been addressing this problem with specialty insoles in my other footwear. However, I decided that I would give this stock setup a valid go before adding a different insole. I am very proud to report, that I did not have to use an aftermarket insole in these boots. I found them extremely supportive, and comfortable, and I had zero pain from plantar fasciitis while using these boots (or the morning after). I was very very impressed by that fact. About half of the miles put on these boots were while backpacking. I would carry around 30-40 lbs on average, but on a few trips I was probably closer to 60 lbs. I think that these boots by far performed the best when the load was 40 lbs or less. However, on the two heavier trips I could definitely start to feel my feet getting quite sore after 8-10 miles. Carrying such a heavy pack is definitely not my norm, but I was getting a newcomer into the sport, and was assisting with carrying some of the load, and quite a large amount of beer. So I was able to make the foot discomfort disappear a bit after we got to camp for the evening. 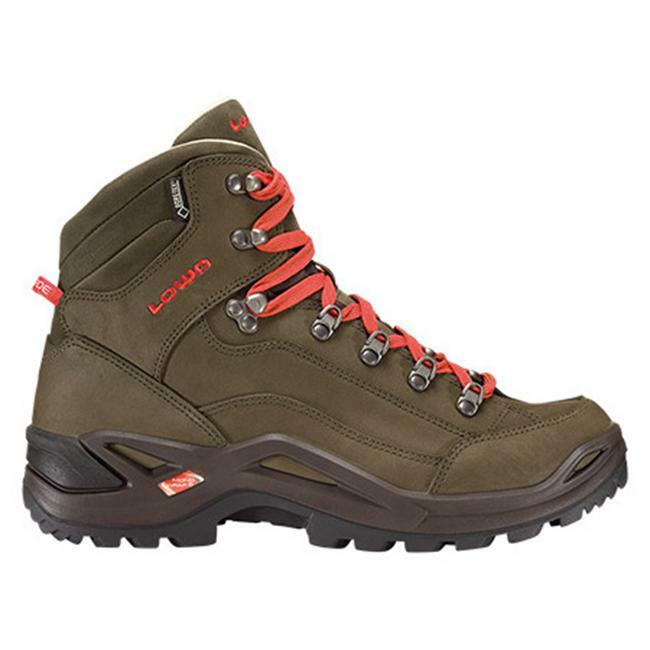 I would definitely recommend keeping the maximum load to 45 lbs give or take a bit for maximum comfort with these boots. The remainders of the miles were on evening and weekend hikes and walks on trails near my home; including a good number on a paved bike trail. I found the comfort factor to be unsurpassed by any other footwear I have used in the past. It was heavenly to walk in these. I do not do a lot of trail running, but I did run several miles here and there through the course of this testing, and found that the comfort factor was not diminished whatsoever while running. Waterproof and extremely breathable is the claim that makes eVent such an in-demand fabric lately in the outdoor marketplace. That’s what they claim, so I wanted to put it to the test. 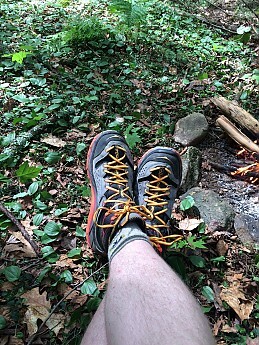 I definitely noticed a remarkable difference in breathability between the Hoka One One Tor Ultra WP boots, and my other backpacking footwear. My feet and socks stayed noticeably drier. I would venture to say that this is the most breathable fabric on the market for footwear. I was thoroughly impressed. I am used to having fairly damp socks at the end of the day, having to hang them etc to dry overnight. Hanging socks is a thing of the past, because at the end of the day my socks were almost completely dry, consistently. A few minutes with my feet out of the boots and they were almost always completely dry. Breathability was not noticeably different between the beginning and end of the testing period. To test the waterproof claims I wanted to do this in several ways, once before they boots really had any miles on them, stream crossings during testing, and again officially at the end of the testing period. As I am sure we have all experienced, most boots claimed to be waterproof start off that way but over time begin to develop leaks. The first test was the bathtub test, filling the tub with water until it reached just above the last eyelet/top of the leather portion. They passed with flying colors, no leakage after 10 minutes of being in the water. Over the miles of testing, I encountered many water crossings, most shallow in nature. Instead of purposefully trying to seek a dry route across I would just trudge right through. And unless water came over the top, I had no leakage at any point during the majority of the testing. The final waterproof test was the last week of testing, I stood in a brook with the boots about halfway submerged for a few minutes, and I had severe leakage in the left boot, and no or minor leakage in the right boot. I accidentally stepped in over the top of the right boot initially, so if there was minor leakage afterwards it may not have been as noticeable. The left boot leaked severely, however, it seems like the leakage was at the seam on the right of the boot just above/past the toe guard. I am disappointed that after a few months of use, the membrane is no longer waterproof. However, since the right boot seems to still have its integrity, it could just be a flaw unique to this pair. Only long term use will reveal the truth. 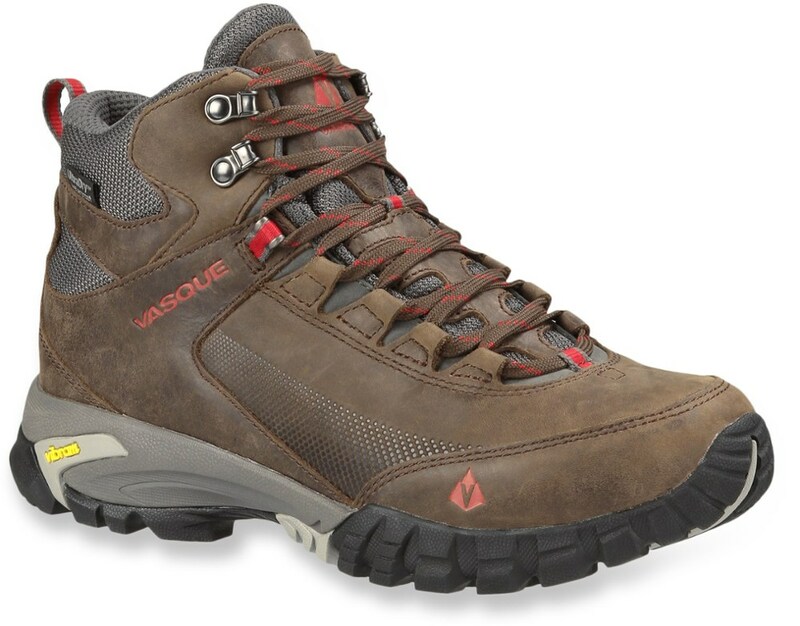 My biggest complaint with waterproof/breathable boots in the past was that eventually your boots would get wet, either from rain, leaking, or taking water in from the top, and that they would then stay wet because they did not breath anywhere well enough to dry out through hiking. Again, I was very impressed with these boots in this department. I purposefully stood in water above the tops of the boots and waited until the boots became filled with water. This took several minutes, as the tops of these boots do provide a pretty good seal. I removed the boots, dumped any standing water out, wringed out my socks, and put them back on and kept hiking for the rest of the day. Within a few hours of hiking on a hot summer day and they were back to adequately dry again, and by morning were perfectly dry. The waterproofness of these boots is about par the course, however the breathability of these boots is unsurpassed in my opinion. Lastly we get to traction. 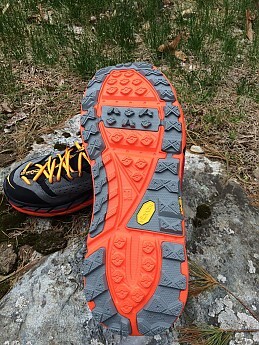 The soft nature of the Vibram MegaGrip outsole provided outstanding traction on a large variety of terrain. Specifically they really shined on wet rock surfaces. I did not encounter any times where the outsoles were the cause of a slip. I did slip every once in a while when going through leaf litter over rocks, but I would not say that was anything abnormal as adequate precautions need to be taken anyway when traversing that specific terrain hazard. Most other boots I have used over the years, if they were going to lose traction and slip always seemed to slip when traversing slick rocks. Not so with these, they remained firmly planted and provided excellent traction. If you’re looking for a very lightweight, extremely comfortable, supportive, and breathable boot with excellent traction then look no further, you have found it! That is if you can look past the bright colors. I would strongly recommend these boots to anyone looking for these characteristics in a backpacking boot. The only reason I would advise someone not to get these, is if you're carrying a load in excess of 45 lbs. Hoka One One has hit a home run with these. I hope to see them establish a strong foothold in the trail running and backpacking market, because if they keep making such amazing products then other manufacturers are going to have a true run for their money. If Hoka One One can perfect the waterproof integrity of these boots, they will be unsurpassed. To all the other manufacturers out there, take note, you indeed have competition. Ken, great review. You've got my interest piques for sure. I have metatarsus primus elevatus and normally have to wear expensive custom orthotics which are a huge hassle to fit in hiking shoes. I think I'm going to give these a try...thanks! I've been very, very curious about these. Thanks for testing and reviewing them, Ken. I'm glad to hear they worked out so well. One question: how light were your shoes? Very informative review....will definitely be taking a close look at these...thanks. Great review, Ken! I have been really interested in these boots, so I am glad to see your thorough review. So far, so good! They're new, but I'm smitten! 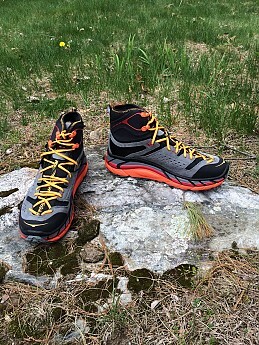 I've been using the Hoka One One Challengers, a trail running shoe, and had hoped they'd be stable enough to use as an approach shoe. They just won't cut it on off camber or technical terrain, but I love them and figured if the Tor was anywhere near as light and comfortable, but more stable, they'd be worth checking out. They've been on my feet less than a week now, but unless they instantly self destruct, they are bound to be a favorite! They reduce impact forces like nothing else I've had on my feet (except for the Hoka Challenger trail runners). Looking forward to getting to know them better. :) Fortunately they seem to break in easily, like a running shoe. Lacing system is secure, adjustable, and quick. Hi, Paul. I'll be curious to hear more about how your Tor Ultras continue to perform for you. Okay, the jury is in! Great shoes! Used them as approach shoes for Cathedral Peak and Half Dome's cable route, as well as other hikes and climbs in Yosemite over the past couple weeks, and they performed marvelously. More than once we joked about how they felt like wrapping your feet in pillows, making long hikes easier on these old dogs by reducing impact forces. The noticeable reduction of feedback (reduced feel through the footwear) was never an issue as the shoes provided a surprisingly good grip or traction, and never slipped. It's too soon to comment on longevity but the near zero break-in time and exceptional comfort and performance should outweigh all but the most severe issues. The construction quality seems to be up to par, so I expect to be able to use these ugly monsters happily for some time to come. Thanks Hoka! Thanks for the update, Paul. Glad to hear they worked so well, and would love to see pictures of them on some of those Yosemite hikes.